Mae hi’n Ddydd Gŵyl Dewi unwaith eto, a’r demtasiwn yw i mi fod yn wleidyddol iawn wrth i ni nesáu at ddwy bleidlais bwysig ar ddyfodol y genedl yn ddiweddarach eleni. Bydd Etholiadau’r Cynulliad ym mis Mai yn achlysur pwysig pan fyddwn ni’n penderfynu sut rydyn ni eisiau cael ein rheoli, a chan bwy rydyn ni eisiau cael ein rheoli, ar gyfer y pum mlynedd nesaf. Fy nheimlad i fy hun yw bod mwy o amhendantrwydd yn yr etholiadau nag a fu o’r blaen, gyda’r posibilrwydd y bydd ein pleidleisiau’n cyfrif yn fwy nag erioed. Mae TCC ac elusennau eraill yn darparu hyfforddiant ar sut i gynnal hystingau, ac rwy’n meddwl y byddai’n beth da i annog ein plwyfi a’n hardaloedd cenhadaeth i gymryd yr awenau mewn digwyddiadau o’r fath – mae gwneud i ddemocratiaeth weithio yn weithred o dystiolaeth Gristnogol, a dyfodol ein cymdeithas sifil yn werth ein hamser a’n hegni. Yna, fis yn ddiweddarach, gelwir arnom i bleidleisio ar fater aelodaeth Prydain o’r Undeb Ewropeaidd. Bydd hyn hefyd yn cael effaith enfawr ar ddyfodol Cymru. Rwy’n teimlo’n ddryslyd iawn am lawer o’r materion hyn, ac mae’n ymddangos i mi bod llawer iawn o wybodaeth anghywir yn cael ei lledaenu – pethau sy’n hollol anwir yn cael eu cynnig fel dadleuon i gipio’r bleidlais un ffordd neu’r llall. Credaf fod mater Ewrop yn fater lle mae gennym ddyletswydd i ymgyfarwyddo ag ef cyn i ni bleidleisio, drwy ddarllen yn eang a myfyrio. Fel y dywedwyd mewn refferendwm diweddar mewn man arall, mae’n gyfle unwaith mewn cenhedlaeth, ac mae ein dyfodol yn dibynnu ar wneud dewis doeth. Ar ddiwrnod sydd nid yn unig yn ddiwrnod i roi diolch i Dduw am fywyd a thystiolaeth sant dylanwadol, y mae hefyd yn ddiwrnod i weddïo dros ddyfodol ein cenedl – a thros ein gwleidyddion. The Assembly Elections in May will be an important point when we decide how we wish to be governed, and by whom we wish to be governed, for the next five years. My own sense is that there is more fluidity in the elections than there has been previously, with the possibility that our votes will count more than ever. TCC and other charities are providing training on how to run hustings, and I think it would be good to encourage our parishes and mission areas to take a lead in such events – making democracy work is an act of Christian witness, and the future of our civil society a worthy call on our time and energy. Then a month later, we will be called upon to vote on the issue of British membership of the EU. This will also have a huge impact on the future of Wales. I find myself very confused about many of these issues, and it appears to me that there is a great deal of misinformation going around – things that are simply untrue being offered as arguments clinching the vote in this way or that. I believe that the Europe issue is one in which we have a duty to inform ourselves before we vote, to read widely and to reflect. As they said in a recent referendum elsewhere, it is a once in a generation decision and our futures depend on making a wise choice. On a day which is not only a day to give thanks to God for the life and witness of a powerful saint, it is also a day to pray for the future of our nation – and our politicians. The Chrism Eucharist is almost upon us at 1100hr on Maundy Thursday, March 24th in the Cathedral, with the celebration of the Eucharist for the Blessing of the Holy Oils together with our Renewal of Commitment to diaconal, priestly and episcopal service as well as the commitment of all the baptized to mission. It has been very good in recent years to see this service becoming a genuine diocesan event, and I would like to stress again that all lay ministers, and members of our congregations, are most welcome to this occasion in addition to all clergy, serving and retired. Clergy are requested to robe in alb or surplice with white stole in the Lady Chapel and then take your seat in the nave by 1050hr. Readers are also requested to robe in surplice and readers’ scarf. Lunch will follow as usual, and will be served in the South Transept, and will be a hot main course and pudding. Again everyone is most welcome to stay for this, however we do need to have an accurate estimate to give to the caterers. I have asked area deans / mission area leaders to collate the numbers of those requiring food from their area. Please would all clergy liaise with their Area Dean / MAL indicating the number of people from their parishes who will be staying for lunch. Every Area Dean/MAL is asked to submit their numbers to Siân at Esgobty no later than TUESDAY 15TH MARCH. Clergy have previously been circulated with the details of the Easter Confirmation service on Holy Saturday at the Cathedral and my thanks to those who have already forwarded the names of candidates. For those who are yet to get in touch, please make sure you submit the details to Siân at Esgobty before Holy Week. I have been asked by Dyffryn Clwyd Mission Area to lead their Holy Week this year. When it came to Easter Eve, I already have the commitment to celebrate the Vigil, Baptisms and Confirmations at the Cathedral. However, I was delighted when the Mission Area accepted my invitation to join me there. One of the creative practices in the mission area over recent years has been to hold a joint Vigil Service, at which the Paschal Candles of all the churches of the mission area are lit to proclaim Easter at this one service, and then borne out the next morning to all the Churches of the area, carrying out, as it were, the proclamation of the Risen Christ. This year, of course, the mission area paschal candles will be lit from the great flame of the Cathedral Paschal Candle, possibly even richer in symbolism because of it, and any Church which is presenting candidates for baptism or confirmation at the Easter Vigil is invited to do the same – to bring their Paschal Candle to be lit as part of the one ceremony, and then carried out to their Churches the next morning. In the feedback documents, the document labeled (d) explores the relationship between Mission Areas and parishes, and this is becoming a much debated issue as present. We are doing significant work at the various diocesan councils to answer the issues that are raised, but let me make one point here for the present. At the moment, Mission Areas are governed by Chapter IVB of the Constitution of the Church in Wales, which is actually the chapter for deaneries, from which both deaneries and mission areas take their current authority. Parishes continue to be governed by Chapter IVC. What these chapters make absolutely clear is that PCCs are subject to the direction of Deanery/Mission Area Conferences (and in turn to the Diocesan Conference and to the Province). Historically, I acknowledge, deaneries have tended to be weak creatures, perhaps not even meeting, but the constitution is clear: they have the authority to get the work of mission done, and PCCs are subject to their decisions. In 2020 Vision, the mission areas are envisioned as having much more authority and being much more active than the old deaneries, and being the primary agencies for mission, for planning and strategy, and for shared ministry. They already have the authority they need by the provisions of the existing constitution, and the permission and encouragement of the diocese to get on with the task. I refer you to the diocesan motto at the head of this Ad Clerum. It was good to see a full Cathedral on Sunday for the service to welcome Mark and his family into our midst. There are three main threads to his work: Youth Leadership Training (being co-ordinated by Tim Feak), Spirituality (being co-ordinated by John Harvey and Pam Powell) and the Hearth project, about which I give more details below. In one of the threads of his work, Mark will be training interested volunteers in an approach to community outreach grounded in personal storytelling. Based on the success of The Hearth, the non-profit business which Mark directs within the United States, training will be focused on helping mission areas develop pubic events that include live music, support for charities, and personal storytelling in which locals share true stories based on a theme. The Hearth is a creative way to get churches involved in community building. One day training events will be held in Gregynog, St. Beuno’s, and Gresford followed by individual coaching and support, as participants plan and organize their own Hearth event. If you are interested in this or any other aspects of Mark’s residency, then contact John Lomas. I am delighted to say that Paulette Gower has been selected to take over from James Harris as Area Dean of Alyn, when James steps down after Easter. Congratulations to Paulette, and our gratitude to James for his leadership over the past years. Sam Erlandson and Karen are delighted by the birth of a second daughter, Eirianwen, who was born on 7th February. Warm congratulations to them. I am pleased to congratulate Nia Williams on her appointment as an Army Chaplain. Nia will leave us in April to take up this role, with our thanks for her ministry among us, and best wishes on a new and exciting chapter of ministry. Jackie Carter has indicated to me her intention to retire at the end of September. I would like to thank Jackie for five years of hard work of witness to the Gospel and for the faithful ministry she has offered to her parishes. We wish her and Rob a happy retirement later this year in south Wales. I am very sorry to record the death of Ginny Burton’s mother, Olive Hobbis, and the death of Dr Joyce Chalmers, widow of Canon Paul Chalmers who retired from the diocese of Manchester to north Wales in the 1980’s. Please note these dates in your diary, commend them in prayer, and be encouraged to join us where appropriate. Some dates are part of the professional expectations of the clergy, and you are asked to take careful note of these in order to avoid future diary clashes. I always try to give as much notice as possible where there are important dates for the diary, and if we don’t list them here, I don’t expect your attendance, although it is always nice to see you at any event or service. 5th March Induction of Huw Butler at Christ Church, Rossett at 1500hr. 24th March Chrism Eucharist, 1100hr in the Cathedral with lunch afterwards. Please encourage your laity to put this date in their diaries also. 26th March Easter Vigil and diocesan Confirmation in the Cathedral, 1900hr. 11th April Induction of Dot Gosling to Llanasa and Ffynnongroyw, SS Asaph & Cyndeyrn, Llanasa, 1900hr. 13th April Deliverance Ministry Training, Glasdir, Llanrwst. This is a mandatory event for stipendiary clergy, and NSMs are warmly encouraged to attend. 17th April Licensing of Lorraine Badger-Watts as Priest-in-Charge of Gorsedd Group, at Ss Mary & Beuno, Whitford, 1530hr. Please note the change of time. 24th April Pool Deanery Confirmation, 1500hr. 19th June Ordination Anniversaries Service, Cathedral, 1000hr. 25th June Petertide Ordination, 1000hr in the Cathedral. 26th June Dee Valley Deanery Confirmation, 1500hr. 3rd July Wrexham Mission Area Confirmation, St Giles’, 1500hr. 18th September Alyn Deanery Confirmation, 1500hr. 28th September Clergy Synod, all day meeting, St David’s Hotel, Ewloe. 3rd October Choral Evensong with the Admission of new members to the Order of St Asaph, Cathedral, 1800hr. 8th October Diocesan Conference, Llangollen. 16th October Mathrafal Deanery Confirmation, St Mary’s Llanfair Caereinion, 1100hr. 20th October Hawarden Deanery Confirmation, 1500hr. 8-9th November Area Dean / MAL 24hr Consultation at Foxhill Retreat Centre, Frodsham. 7th December Nicholastide Confirmation at Cathedral, 1830hr. 7th-8th March Area Dean/MAL 24hr Consultation at Foxhill Retreat Centre, Frodsham. 19-22 September Clergy Residential Conference at St Anne’s College, Oxford. 7th-8th November Area Dean/MAL 24hr Consultation at Foxhill Retreat Centre, Frodsham. On Sunday, 19 June, I would like to invite those who will be celebrating a significant ordination anniversary during 2016 to join me for a special celebratory Eucharist at the Cathedral at 1100hr – anniversaries such as 25 years and the subsequent ‘0’ or ‘5’ anniversaries thereafter. If you have a special anniversary this year that you would like to celebrate with us on June 19th then please contact my office at Esgobty by 15 May. Nominations are invited for the Order of St Asaph in 2016 as we seek to recognise and honour the outstanding contribution of lay persons at diocesan level, particularly at an appropriate point on the completion of service in a particular way or in a particular role. Admission to the order is marked by the presentation of appropriate insignia, and those admitted to the order are listed in the diocesan Yearbook. Please complete The Order of St Asaph Nomination Form and returned it with as much information as possible about a candidate’s contribution to the diocese. All members of the Teulu Asaff, whether clerical or lay, are encouraged to make nominations, which can also be submitted through any diocesan council or committee. Nominations forms should be submitted to me at Esgobty by the end of April, and will be referred to the advisory committee who will meet in early May. Understandably there are those who have offered sterling service to the church within a parish or deanery context. 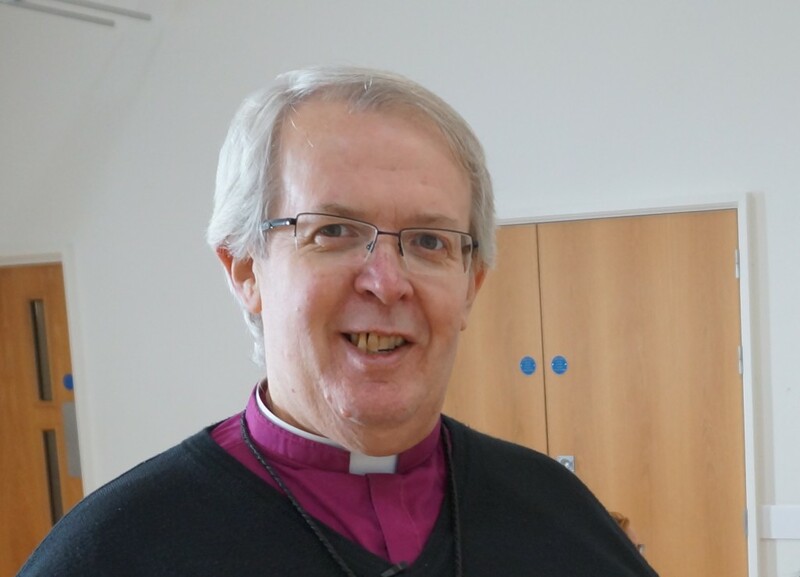 Whilst the Order of St Asaph is intended to recognize diocesan service, I am happy to be approached by parishes and deaneries who feel someone’s outstanding contribution to their life should be recognized and I will be happy to issue a suitable certificate that can be used by the parish or deanery for a local presentation. Please contact Michael at Esgobty in the first instance with appropriate details for me to consider. This year the Admission of new members of the Order will take place at Choral Evensong in the Cathedral on Monday, 3rd October at 1800hr. I have a small number of eggs which are sent to me to promote sales, and which I offer as donations to parishes to support their fundraising. Please contact Esgobty if you would like to reserve one. I wish you every joy and grace in believing as you approach the celebration of the Passion and Resurrection of Our Lord. Redeeming God, in this season of deepening awareness, give us the courage to rise like the prodigal, turn, and head home to your welcoming embrace. You are the one that loves us into being. You are the one who holds our true identity. Help us to trust you and to trust our brother Jesus. Help us to find our place in the family of faith where we can sit at table sharing stories of how your love found us and saved us and restored us. Amen. Dduw’r gwaredwr, yn y tymor hwn o ddyfnhau ymwybyddiaeth, rho’r dewrder i ni godi fel yr afradlon, troi, ac anelu am adref i’th fynwes groesawgar di. Ti yw’r un sy’n dal ein gwir hunaniaeth. Helpa ni ymddiried ynot ti ac i ymddiried yn ein brawd Iesu. Helpa ni ddod o hyd i’n lle yn nheulu’r ffydd lle gallwn ni eistedd wrth y bwrdd yn rhannu straeon am sut gwnaeth dy gariad di ddod o hyd i ni, ein harbed a’n hadfer ni. Amen.